In the last post I shared a few of our favorite discoveries. In this post, I would like to share a few of the requests for information received this past year. WE DON’T HAVE TIME TO DRIVE ROUTE 66. WHAT SITES CAN BE ACCESSED FROM THE INTERSTATE BETWEEN TEXAS AND CALIFORNIA? Even though it is not actually on Route 66, I would suggest a visit with Dan Rice on Santa Monica Pier in Santa Monica, California. I would also suggest a cruise through Seligman, Arizona, with a stop at Angel’s. The Route 66 Museum in the old Harvey House in Barstow is a good stop. At the opposite end of the complex is a delightful railroad museum. The Route 66 Museum in the Powerhouse Visitor Center in Kingman, Arizona would be a great stop. As a bonus, you can cruise a long, scenic section of Route 66 from the Oatman Road exit west of town to the Andy Devine Avenue exit on the east end and stop at Mr. D’z Route 66 Diner for a cold root beer in a frosted glass mug or the Dambar for a hearty dinner. The Midpoint Cafe in Adrian, Texas is easily accessed. If you don’t stop for lunch at least try the pie. WE HAVE ONLY A WEEKEND. WHAT SITES DO YOU SUGGEST IN EASTERN OKLAHOMA? 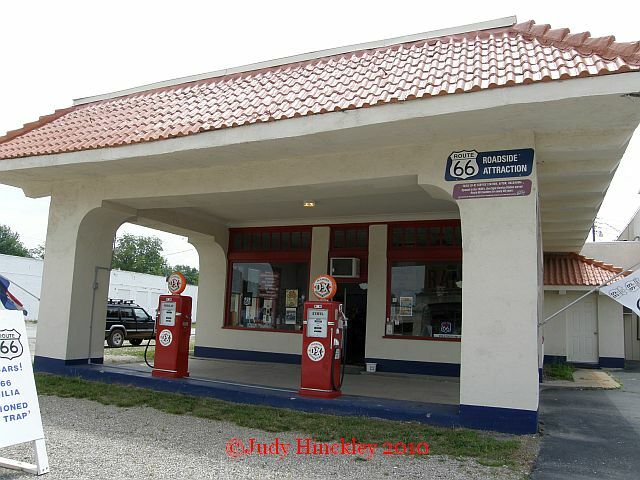 Well, if your time is limited, your travels take you to eastern Oklahoma, and you want one stop that encapsulates the Route 66 experience it would have to be Afton Station in Afton. This amazing gift shop/museum/information center manages to capture the very essence of the legendary highway in a vintage gas station. Of course, what really makes this stop unique is the people. Laurel Kane, Ron Jones, and a few regulars ensure a stop here will fuel a hunger for the Route 66 experience that will soon have you buying guide books and planning a road trip of discovery on America’s most famous highway. WE HAVE NEVER STAYED AT A MOTEL THAT WASN’T PART OF A CHAIN. DO YOU HAVE RECOMMENDATIONS? The Blue Swallow in Tucumcari. The Wagon Wheel Motel in Cuba, Missouri. The Rail Haven in Springfield. These are three excellent choices. However, to really get the feel of a Route 66 adventure its tough to beat the Wigwam Motels, one is in Holbrook and the other in Rialto, California. Though they are derived from the same plans each offers a unique perspective on Route 66. The Wigwam Motel in Holbrook, from its vintage furniture to dusty parking lot, seems frozen in time. Here it is still 1960. The Wigwam Motel in Rialto is a recreation. The restoration of this property with an attention to detail enables the visitor to experience life on the road when motels such as this were the newest and best. Tasteful intrusions from the modern era such as a flat screen television are the only intrusion into the illusion. In the following days I will respond to other requests and inquiries. Do you have questions about an adventure on Route 66 or the road less traveled?